Parbold has a rich waterway navigation heritage. The Leeds & Liverpool Canal celebrated its bicentenary in 2016, but the Canal first reached Parbold 244 years ago, in 1774. Before this, the area was bisected by the Douglas Navigation, opened in 1742. The Douglas Navigation was abandoned in 1782 when the order was given to remove the gates from the locks. To understand the history of the Leeds & Liverpool Canal in Parbold, it is useful first to know something of the Douglas Navigation. In the late seventeenth century Liverpool was developing as an important port but commercial activity was limited by the difficulty experienced loading and unloading ships in the tidal estuary. The answer was to build what was to become the world’s first wet dock specifically designed for commercial activity. The Liverpool merchants engaged Thomas Steers to build the dock and it was opened for business in 1715. Having improved the dock facilities, the next step was to improve transport routes inland from Liverpool, to allow merchandise to be distributed, but significantly to improve the supply of coal to the port. Steers surveyed the rivers Mersey, Irwell and Douglas in 1712 with a view to making them navigable. The Mersey & Irwell Navigation was completed in 1725, but it was forty years before the Douglas Navigation was in use. The River Douglas rises in the Pennines, flows south to Wigan (with its considerable coal deposits) and from there, north-west through Parbold to Tarleton on the Ribble Estuary. The first Bill to construct the Navigation was submitted in 1712 but met with considerable opposition from local landowners. A second, successful, Bill was submitted in 1720 resulting in ‘An Act for making the River Douglas, alias Asland, navigable from the River Ribble to Wigan, in the county palatine of Lancaster’. Construction started immediately but came to a halt the following year, 1721, as the country was hit by the financial crisis known as the South Sea Bubble. Much of the money raised for the project disappeared – lost on stock-market speculation – and litigation followed. It was not until 1737 that construction resumed, by which time the company was controlled by Alexander Leigh, an attorney and agent for the Earl of Balcarres. The Navigation was in use by 1741 and completed in 1743. The Navigation originally had thirteen locks, including one at Parbold just south of where the Canal now crosses the river, and which can be seen on the 1802 Leeds & Liverpool Canal Survey called ‘Old Lock’. Evidence on their construction is scant, though an article in the Leeds Intelligencer newspaper on 1st November 1774 refers to the first lock on the river out of Wigan as having timber sides (in contrast to the masonry lock chamber walls that we are more accustomed to today). It is not clear whether this is representative of all the original locks. The Navigation was constructed for use by sailing boats, or flats, and so no towpath was provided. These coastal flats could carry a cargo of 15 to 40 tons. A report made in 1776 showed the Navigation carried 12,000 tons annually, mostly coal but also limestone and some foodstuffs. Two thirds of this tonnage went to Ireland with the rest heading up the Ribble, or to the Lancashire coast. The proposed canal between Leeds and Liverpool would have meant considerable competition for the Douglas Navigation and initially Alexander Leigh objected. However, he was clearly persuaded otherwise as by 1771 he had soldhis controlling shares to the proprietors of the Leeds & Liverpool Canal giving them ownership. Initial impetus came from John Stanhope, lord of the manors of Horsforth and Thornton (in the Leeds/Bradford area) and colliery owner. In 1766 he engaged Halifax engineer John Longbotham to survey a route and this was presented in 1768. On Stanhope’s death, in 1769, the baton was passed to John Hustler, a Bradford wool merchant. Hustler published a pamphlet outlining the advantages of the canal, the chief of these being that the proposed route passed through important coal and limestone producing areas. To paraphrase Hustler, where there is coal, limestone is needed, and where there is limestone, coal is needed. Two organising committees were established, one in Yorkshire and one in Lancashire. As each committee had different aims, there was considerable disagreement on the route. The Yorkshire committee wanted the quickest route through Lancashire to Liverpool. The Lancashire committee wanted the canal to service the major coal mining areas around Wigan and the developing industrial towns of east Lancashire. The Yorkshire committee won the day, but as will be seen, the Lancashire committee got their way in the end. The Act of Parliament required to build the canal was obtained in 1770. The route enshrined in the Act was to take the canal from Leeds, up the Aire valley, through Bingley, to Skipton and Gargrave. From here it was to head south to the summit at Foulridge and down to Colne. From Colne the route followed first Pendle Water, then the River Calder and finally the River Ribble to Bamber Bridge, south of Preston. The route then headed south through Leyland and Eccleston to Parbold. From Parbold it headed eastwards through Burscough, and then south through Halsall and Maghull to Liverpool. It will be noted therefore that at this stage the canal was planned to head north from Parbold, not south as it currently exists. Meanwhile, in October 1773, it was reported that ‘near 31 1-half miles were finished and navigable near Liverpool to near Gathurst Bridge, on the Douglas; except a small part of the banking and aqueducts upon the Douglas and Alt vallies’. The observant will note that Gathurst Bridge is south of Parbold and therefore not on the route defined by the Act of Parliament. So why was the canal heading to Gathurst Bridge? It will be remembered that by now the Douglas Navigation was controlled by the proprietors of the Leeds & Liverpool Canal. Thirty years after completion the condition of the Navigation had deteriorated (at least some of the locks were made of timber rather than stone) and it required investment. Furthermore, by the late eighteenth century, navigations, that is, navigable rivers, were old technology. A massive advance in transport in their day, they nevertheless had their disadvantages. Too much water in winter, too little in summer; meandering routes; shoals, and competition from other water users. The canal proprietors therefore undertook to replace the Navigation with a canal and in the first instance this branch to the main canal linked Parbold to the Douglas Navigation at Dean Locks near Gathurst Bridge. The canal from Parbold to Wigan was initially referred to in newspaper reports as the ‘Junctive Canal’’ but for much of its working life it was known as the Upper Douglas Navigation. It was not until 1891, when the canal proprietors finally obtained all the Navigation shares, that this section of canal finally became officially part of the Leeds & Liverpool Canal. The Douglas Navigation was completely bypassed when in 1781 the ‘Junctive Canal’ was extended to Wigan, terminating at the transhipment warehouse at Wigan Pier. The lower end of the Navigation was also bypassed by the Lower Douglas Navigation, or the Rufford Branch as we know it today, opened in the same year. The Leeds & Liverpool Canal proprietors ordered the gates to be removed from the locks on the old Navigation in 1782. By 1781 it was possible to sail from Liverpool to Wigan in the west and from Gargrave to Leeds in the east. However, construction came to a halt for the remainder of the decade. Since 1775 the British army had been engaged in the American War of Independence. The War reduced trade with the American colonies and increased the cost of labour. The economic conditions were not right to continue construction. When, at the end of the 1780’s, conditions had improved, the question of the canals route across Lancashire was raised once more. It was decided to alter the route taking it through Burnley, Blackburn and Wigan – coal having proved to be the more valuable cargo. The Lancashire Committee had finally prevailed. Consequently, another Act of Parliament was required, and this was obtained in 1790. Amongst other things, the new Act outlawed the use of swing bridges and this is why they are seen at either end of the canal but not in the middle section. Construction resumed at the east end, at Gargrave, and headed westwards. The consequence of this change of route for Parbold was that the works to take the canal north from the village were abandoned. All that now remains of this 1770 Parliamentary route is Parbold’s dry dock as can be seen on the 1802 Canal Survey. The Lancaster Canal played a fundamental role in the completion of the Leeds & Liverpool Canal and therefore a brief diversion from the story is required. The merchants of Lancaster, Preston and Kendal had been agitating for a canal to link them to the coal around West Houghton, and the markets of Manchester beyond, since 1770. It wasn’t until 1792 that a route was agreed, and an Act of Parliament obtained. Construction began under engineer John Rennie. The first section, linking Preston to Tewitfield was opened in 1797. By 1801, the southern section between Walton Summit and Bark Hill (Aspull, near Wigan) was opened. It was the intention to link the two sections with an aqueduct over the Ribble at Preston and to continue the canal southwards to West Houghton. In practice neither of these things happened. The former because the money was never available, the latter because the completion of the Leeds & Liverpool Canal, and in particular the Leigh Branch, rendered it unnecessary. Meanwhile the Leeds & Liverpool Canal reached Burnley in 1796, Enfield by 1801 and Blackburn by 1810. At this time the proprietors had to consider the route from Blackburn to Wigan and they couldn’t help but notice that there was already a canal, the southern section of the Lancaster Canal, extending for most of the route. 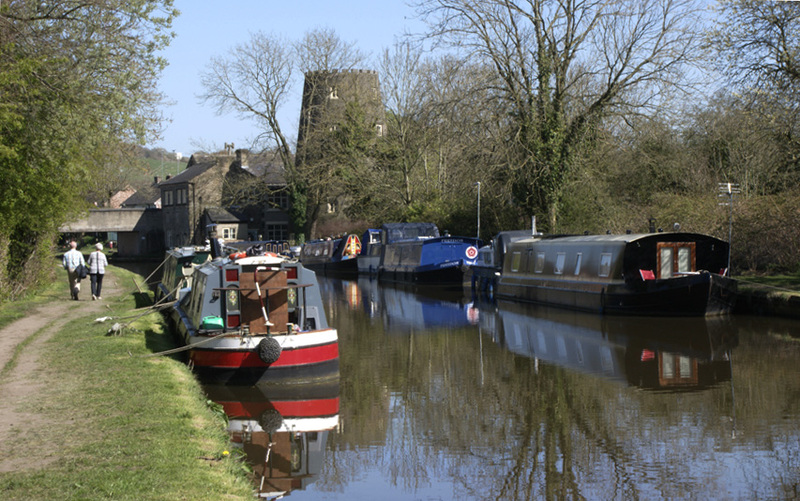 Negotiations were entered with the proprietors of the Lancaster Canal and it was finally agreed that the two canals should be linked together at Johnsons Hillock and at Bark Hill. The Lancaster Canal built the flight of locks at Johnson’s Hillock and the Leeds & Liverpool Canal built the flight of locks out of Wigan up to Bark Hill. These works were completed in 1816 and the link between Leeds and Liverpool was finally made, forty-six years after construction had begun. At 127 ¼ miles long, it was the longest canal built as a single endeavour, and, when combined with the Aire & Calder Navigation, the first to provide a link between the east and west coasts. The southern section of the Lancaster Canal was owned and managed as part of the Lancaster Canal until 1864 when it was leased to the proprietors of the Leeds & Liverpool Canal. In 1820 a canal was built linking Wigan to the coal deposits around Leigh – the Leigh Branch. This canal joined onto the Leigh Branch of the Bridgwater Canal providing a link to Manchester. Britain’s navigations and canals were fundamental to the Industrial Revolution. They provided the means to transport large quantities of bulk materials, significantly coal and raw materials (wool and cotton); they formed for the first time an effective nationwide transport network; they provided the means to distribute finished products safely (particular significant for the Potteries which saw much of its produce damaged on the pot-holed roads that predominated before the canal network arrived). Their pre-eminence was short lived however as the 1840’s saw the arrival of significant competition in the form of railways. Many canals were bought by railway companies, run down and abandoned. The Leeds & Liverpool Canal however survived. Back in 1769 John Hustler predicted the major cargoes would be coal and limestone. He was half right with coal proving to be the mainstay. In 1783, almost 90,000 tons of coal were carried on the nascent canal. By 1866 this had risen to 1.9 million tons. The canal continued to carry coal into the 1960’s when a series of severe winters froze the canal prompting carriers to look for alternatives. They found road transport and never came back. Today, much of the canal network in England and Wales, is looked after by the Canal & River Trust. In addition to caring for 2,000 miles of waterways, the charity also has responsibility for more than 1,500 locks, over 3,000 bridges, 344 aqueducts, and almost 2,000 culverts. Some 2,700 of these structures are listed, making it the third largest collection of listed structures in the land. The Trust’s network also provides vital habitats for aquatic plants and animals. Many canals and rivers pass through some of the most heavily populated communities in England and Wales, providing accessible green and blue space where it’s needed the most. Research shows that spending time by water, whether it be during a lunchbreak, on a daily commute or just a weekend stroll, really does make people feel happier and healthier. With ever increasing rates of obesity, stress and declining mental health in the UK, the canals and rivers are uniquely placed to make a significant contribution to improving the wellbeing of millions of people. It would not be possible to look after such an extensive network without the help of an army of enthusiastic and passionate volunteers. If you would like to get involved with caring for your local canal, to meet like-minded people, spend time in the great outdoors, and have plenty of fun along the way, visit to find out http://canalrivertrust.org.uk/about volunteer opportunities in your area. In Parbold a group of dedicated volunteers have begun restoring the dry dock. This dry dock is important because, as we have learnt, it is the last remnant of the 1770 Parliamentary route that was never built. If you would like to join this group contact the volunteer coordinator at sara.ponting@canalrivertrust.org.uk.